Immortality is, ultimately, the bottom line consideration when assessing the quality of a movie, at least in most cases. And in the case of Self/Less, it is exactly such a case. Movies mean as much as they do to us because they are patterns, fictional simulations of how we would (and should?) act when faced with moral imperatives or dangerous encounters. That is why they interest us--because they help us further define ourselves. The film is, in large part, an action-thriller, but also doubles as a romance. Not to leave anything out, it touches on moral considerations that affect us all. Screenwriters David Pastor and Alex Pastor have gone way out of their way to construct a powerful story in which the human brain of a successful business tycoon is transferred into a younger, healthier body. With director Tarsem Singh manning the helm, this ship goes into some mightily soul-searching areas. Some might consider it a pretty tall order to have Ben Kingsley transforming into anyone resembling Ryan Reynolds, but if that bothers you, it will be almost twice as difficult to imagine Kingsley's miserly character, who is on death’s doorstep from terminal cancer, as a non-cutthroat person with a strong sense of morals and compassion in Reynolds’ character. 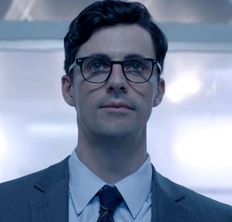 Putting aside these issues, audiences will watch with intense fascination as the wealthy Damian, surrounded by lavish gold and opulence, pays $250,000,000 to a secret biogenic corporation (headed by Matthew Goode as “Albright”) for a body swap—or, as it is termed in the film, “shedding,” like a snake. But, “death has some side effects,” so says Albright mysteriously. This he tells the newly re-made Damian about potential rejection complications, which begin to manifest in what are at first thought to be just hallucinations and distorted visions. Through these perceived hallucinations, Damian is led to seek out “Madeline” (Natalie Martinez) and her young daughter (Jaynee-Lynne Kinchen—a wonderfully effective child actress, by the way). The small romantic element that begins to build between the two is slow to win us over, but finally gets us on board, thanks largely to Martinez’ ability to emote well, thereby making us feel her sense of shock and heartbreak. One other subplot concerns Damian's estranged daughter “Claire” (Michelle Dockery). This is one of those elements that you see coming from way away, although the resolution is one of the least satisfying things about the film, hands down. Right along with its thick sci-fi underpinnings, this one is a thriller all the way to the bottom. Great shoot-outs, good hand-to-hand takedowns, and some very vivid car chases take Self/Less up a notch or three. With Singh’s attention to detail, we are not left to use our imaginations very much. No one can say any part of this is boring! Reynolds is as charming and convincing in his role as you’d expect, but his nemesis, Goode, is a bit much to handle. He handily outclasses the bizarreness of even the most audacious James Bond villain. There are some stretches by way of plot believability with certain twists seeming to be on the far side of unlikely, but these are not hard to put out of our minds. Most of viewers' concerns are vested in putting themselves in the shoes of Damian who is facing a predicament that has simply not been faced since...Frankenstein? How would you handle being caught between two lives in one body? 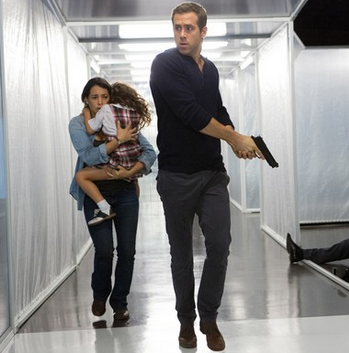 Self/Less is a jarring and very entertaining watch. Even with all that it tries to take on and with merely decent acting and some hit-or-miss dramatic components, the film can be called a neat-and-tidy success. It’s shortcomings do fairly little to detract from its positive, inner-reflective qualities on the subject of mortality and the value of human life.